Sometimes, regret is dead weight carried through life. Other times, its fuel. Let’s face it, our life is full of crowns. But most forget to leave the ‘crown’ at work. Which should be chosen? It’s never easy. Letter 17 was written from such thoughts. Every executive has their regrets. I remember a former CEO once discussing balance. Truth be told, everyone leaves a legacy. Mostly, that legacy is either “It’s all about me,” or “I’m going to do something worthy for someone else.” You’ll have few regrets if you aim high and miss. However, most aim low and hit. Settling for second best, every annual performance review received, the willingly open and accept the gift called ‘regret.’ In truth, God bestowed upon many a healthy mind, a healthy body, fruits of the field, the garden, the corn, the wine, the oil. All, tokens of favor. But because these bountiful gifts are so selfishly utilized, they lose them all. So, a few thoughts. First. 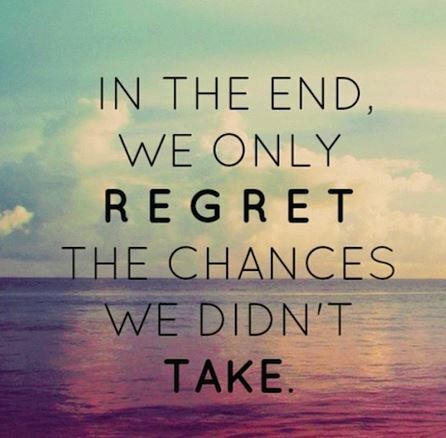 Living life too cautiously and keeping the status quo leaves regrets. Remain outside of your comfort zone and watch zone expand. The more risks you take, the easier it becomes. Second. You always have yourself. So, work on it and make it your best relationship. Third. As long as you are loved, respected, and treated well, I will always be happy. Fourth. Faith is God’s hotline to you. Honor yourself by walking in faith. Rest in faith, work in faith and love in faith. There’s one last lesson … Honestly, of all the places I’ve been, I never imagined earth had so much love. How that moment shines for me still when I hold your hand. Know that I love you and will always be there for you. No matter what, I’ve got your back. I love and adore you. There is nothing you could possibly do to change that. With you, there are no regrets.